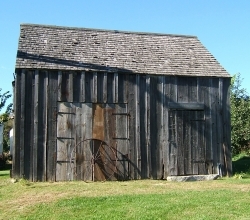 The circa 1840 Clark Blacksmith Shop was one of several buildings within Stonehenge Farm which is still home to the Clark family today. Only the frame and roof were intact when it was moved by the Historical Society in 1998. It now sits atop the original oak beams and is a fine example of a 19th century trade shop. Structural restoration is complete, although the Society would like to replace the reproduction forge with an actual 19th century forge. The shop contains many 19th century tools and a variety of early iron objects such as hinges, horseshoes, nails, hardware and other items routinely used in rural New Hampshire. A very large leather and wood bellows, used to inject air into the forge, was rescued from the original shop.